Riding your horse in Two-point Position puts minimal weight on your horse’s neck and back, therefore permitting your horse to jump more easily. This also helps the rider improve his or her leg techniques since it is only their lower legs that keeps them placed in a horse’s saddle. If you’re fond of horseback riding and wanted to do this feat, kindly read the instructions below. When entering Two-point Position – When doing this, you must shorten the reins and stirrups first to retain contact with your horse’s mouth. Assume normal riding position with your both legs and seat fully on your horse. Sink your weight in your heels and maintain that position for as long as you’re comfortable with it. Take a handful of horse’s mane in your one hand to help you keep your balance. Push your hips and rear upward slightly above the horse’s saddle to help your straighten your back and align your heels, knees and shoulders. Steady yourself until you find your balance point and resist squeezing your knees as you keep yourself upward. Always make sure that you bend your knees forward to keep yourself up with your horse’s motion. When Riding in Two-point Position – When you’re in balance, squeeze your legs in order to make your horse move forward. 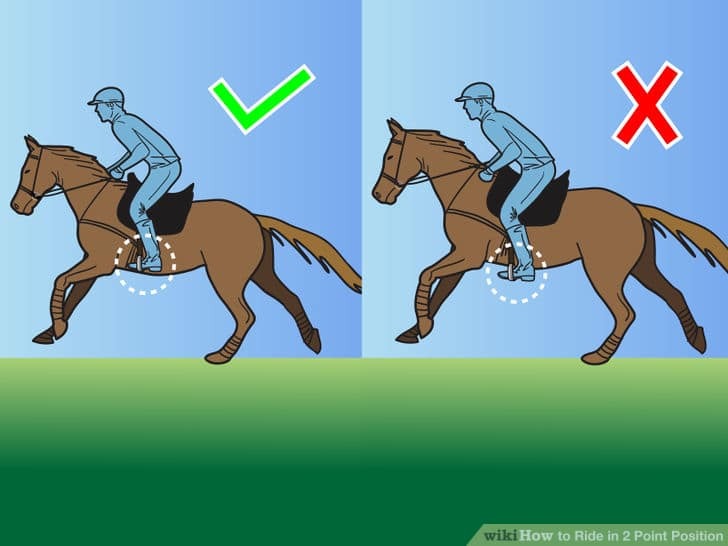 Press the horse with your left leg if you want your horse to go right while slightly loosening your right hand to permit your horse to go to that position. If you want your horse to go the other way, just use the mirror image. Revert to three-point position once you feel uncomfortable with it.